Gordy & Sons Outfitters and Bonefish & Tarpon Trust have announced the launch of the BTT Texas Tarpon Acoustic Tagging Project. This will expand the original tagging project to include the Texas coastline and help scientists to gather more information about tarpon migration. 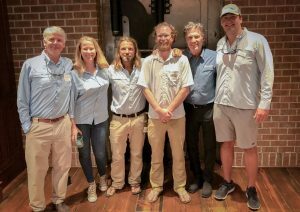 HOUSTON (June 5, 2018) – Gordy & Sons Outfitters and Bonefish & Tarpon Trust (BTT) are pleased to announce the launch of the BTT Texas Tarpon Acoustic Tagging Project. The family behind the finest hunting and fishing retailer, which is based in Houston, is generously funding the first year of theTexan tagging initiative to harvest local data from the tarpon migration that spans the western Gulf of Mexico and as far north as the Chesapeake Bay area. BTT Texas Tarpon Acoustic Tagging Project, sponsored by Gordy & Sons Outfitters will expand the overall initiative to include the Texas coastline, which is currently focused from South Carolina through the Florida Panhandle. “It’s essential that BTT determines the amount of connectivity on this broad scale so that we know the spatial scale at which management needs to occur, and the extent that tarpon behavior is similar throughout their geographic range,” explains Dr. Aaron Adams, BTT Director of Science & Conservation. About Gordy & Sons: Having opened its doors in May 2017, Gordy & Sons Outfitters is an independent, family-owned retail business founded because of a love for hunting and fly fishing, bespoke and fine guns that are voraciously collected and fielded. Located in an 11,000 square foot 1950’s-style stucco building, Gordy & Sons also carefully curates rare sporting art impressively displayed, and keeps up with the local culinary game world, supporting wild food and sustainable resources. With a team of gunsmiths on site for services and repairs, a dedicated customer service team and unparalleled knowledge of the industry, Gordy & Sons is the nation’s premier destination for outdoor pursuits products and services. For more information, visit www.gordyandsons.com.